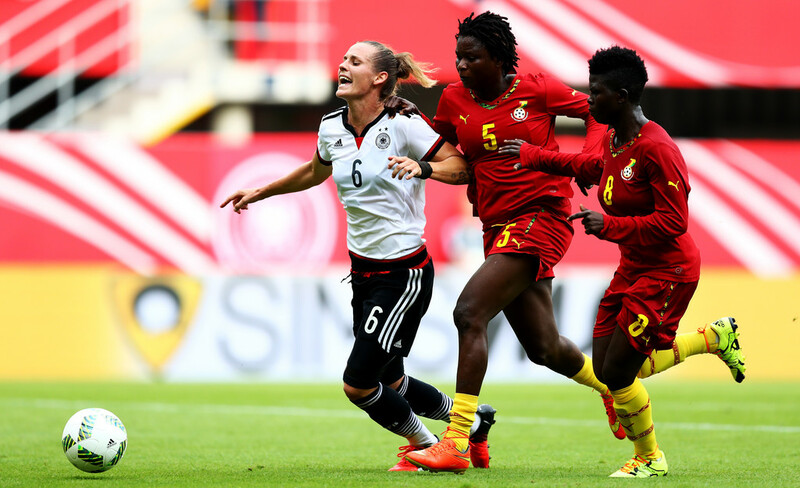 Ghana’s senior female football team, the Black Queens suffered their heaviest defeat on Friday evening when they succumbed to an 11-0 thrashing at the hands of their German counterparts in Paderborn, Germany. The Germans strolled to victory in the international friendly as they warmed up for the Olympics in some style. The damage was done in the first-half as Alex Popp bagged a brace and Anja Mittag grabbed four goals for herself. Dzsenifer Maroszan and Saskia Bartusiak also got on the scoresheet, with an own goal from Ghana making it 9-0 at the break. Maroszan and Mandy Islacker also scored late on to crown a great win for Silvia Neid’s side. Moments after Germany and Ghana resumed the second half in Paderborn, news began to emerge of a major terrorist incident in Munich. The game couldn’t have got off to a better start for Germany, who went 1-0 up inside the first minute. A stunning volley from Melanie Behringer brought a great save from the Patricia Mantey, but Mittag was quick to pounce on the loose ball and fired under the stranded stopper. One became two not long after. A fantastic cross to the back post from IsabelKerschowski found Maroszan unmarked at the back post. Given the space she was in, theOlymipque Lyonnais midfielder would have been forgiven had she taken a touch. Instead, in trueMaroszan fashion, she volleyed it home first-time. It could – and should – have been three-nil within the opening nine minutes but for Laudehr to poke 13’s pass just wide of the mark. But Germany didn’t have to wait much longer to add a third, as Popp got on the scoresheet. A lovely passing move allowed Laudehr to sneak the ball in to Popp, who confidently finished past Mantey. Ghana were starting to hold their own in the game, at least in terms of keeping Germany out, but found set-pieces hard to cope with.That was where the fourth goal came from, as a deep corner towards the back post found Popp. She headed back across goal, and Cynthia Adobea deflected into her own net. That opened the floodgates once more, as Germany scored another three goals to cap off a fine five-minute spell. The first came for Batusiak, who had the simplest of tasks to tuck home a header from Laudehr. Däbritz popped up with the second of the trio, stroking home a fine left-footed shot into the bottom corner from the edge of the area. Mittag rounded off the scoring burst with her second of the game, finishing well past Mantey from close range once more. Her hat-trick followed eight minutes later, when she rounded off Laudehr’s good build-up. The forward wasn’t finished there and made the most of Popp’s header to make it nine and score her fourth before the break. The second half started in the same vein the first ended, although there was no goal for Germany in the first 15 minutes. Däbritz, who was in a creative mood, brought a fine save from Mantey before Popp headed the corner wide at the back post. Mantey was proving a source of frustration for the hosts, as she denied Maroszan on the hour. Perhaps the quartet of changes had effected the rhythm, although none of the four players to come on took any quality from the side. One of the replacements, Melanie Leupolz, came close to another goal but her half-volley slid just past the top corner. Another let off for Ghana. The game ended 11-0 and was a good chance for Germany to build confidence ahead of the tougher tests to come, as Islacker and Maroszan brought the game into double figures. They will be confident of keeping that going up until the crucial clash with Canada. Neid, of course, will be happy with the first-half ruthlessness that her side showed.